Roasted Garlic is probably a gift from the “gods above”. It is simply divine. Near the start of our relationship, BD and I were doing surf and turf at home - filets, king crab, loaded baked potatoes, and I think we also made prosciutto-wrapped asparagus that night as well. There wasn’t any real occasion…it was simply what we were in the mood for. I remember we had one of the best cuts of filet I’ve ever had. It was pricey when we bought it, but worth every penny. For whatever reason that night, I suggested making Roasted Garlic Butter for on top of the filets. I know I must have seen it somewhere – probably the Food Network – but I can’t remember where exactly now. 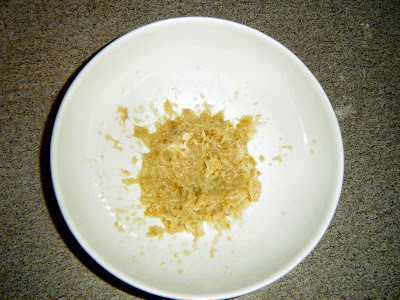 I’m not going to call this a recipe, but below is how you can make roasted garlic butter. 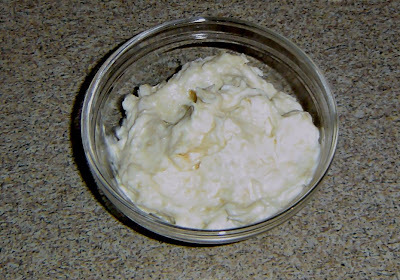 It’s super easy and tastes so yummy on steaks, potatoes, veggies….almost everything! 1- Slice the very top of the garlic off so that the cloves are exposed. 2- Place on a sheet of foil and drizzle some EVOO over the top of the head. 4- Allow to cool and then unwrap foil carefully. 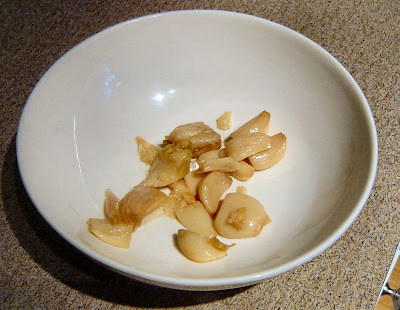 5- Take bulb and squeeze the roasted garlic from the bulb and into a dish. 6- Mash garlic until smooth. Then add 4 tablespoons of butter* and mix together. 7- Place in fridge or freezer to set for at least 10 minutes. * This gives you a fairly strong garlic flavor. If you want it a little less potent add more butter until you achieve the amount of flavor you desire.